A miscellaneous collection of photos of disused stations and lines throughout East Anglia. Some of these shots were taken nearly forty years ago. Much has changed in that time, Some of the stations no longer exist having disappeared under housing estates and road improvements. Bridges and other infrastructure are disappearing at an increasing rate, although some of the Victorian architecture has been preserved. References used for dates and information unless otherwise stated, Forgotten Railways (East Anglia) R.S. Joby and A Regional History of The Railways of Great Britain Volume 5 by D.I. Gordon. Contributions to this album would be very welcome. Raydon Wood, Suffolk. 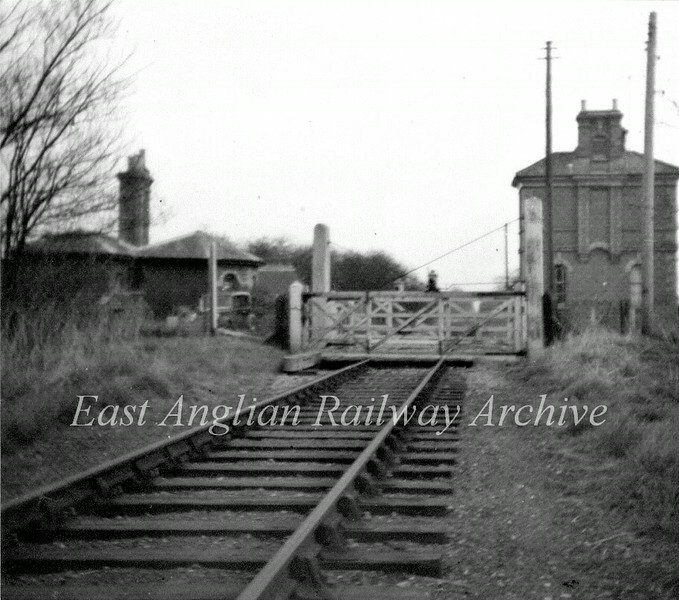 Approach to the station from the Hadleigh direction with the ornate crossing keepers lodge on the left which is these days much altered. c1965. Photo Brian Leighton.